Good morning, my dear friends and faithful readers! I’ve got more news to report and more album reviews to share, and it’ll all get published eventually so bear with me — it just happens to be a pretty busy time of year for corporate office job slaves such as myself (what with everyone around me taking week-long vacations constantly, leaving me with piles of excess crap to deal with). 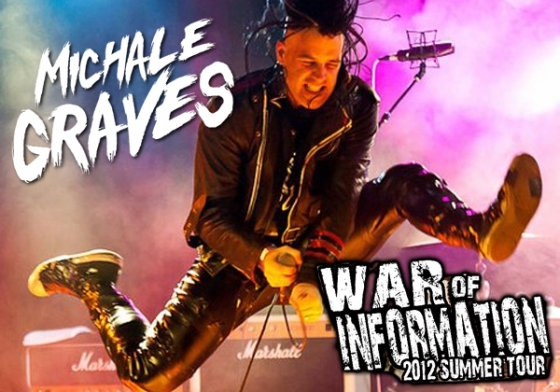 Anyway, I wanted to remind you about the Michale Graves “War of Information Tour” that’s still going on (read my earlier post about the tour here or just catch a summary of the remaining dates at the end of this one). Particularly for western or central Pennsylvania readers — note that there’s a stop in Altoona tonight, and once again The Cheats will be enlisted as an opening act!